Cobra Flex pneumatic air hoses provide superior flexibility and lay flat. 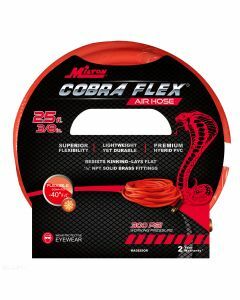 Unlike standard rubber air hoses, the Milton Cobra Flex is made from a hybrid polyvinyl chloride material, which is perfect to eliminate kinking. This unique compressed air hose differs from the competition, as Cobra Flex relies on sturdy brass metal hose ends as opposed to soft aluminum. This multipurpose air hose remains flexible down to -40 degrees Fahrenheit and offers up to 300 PSI. Designed for use with power tools, filling tires with air and other compressed air applications, Cobra Flex is UV, oil and abrasion resistant. This hose is great for everyday use in construction, automotive, industrial, agriculture and fleet applications. The lightweight Cobra Flex will not change colors or fade when exposed to nature’s elements, unlike competitor air hoses. Available in various lengths and sizes, all Cobra Flex air hoses include a bend restrictor to further prevent kinking.